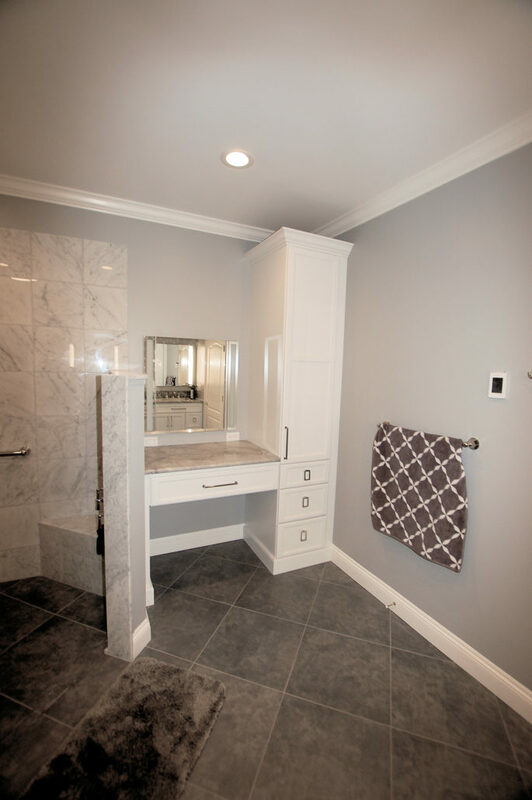 Master Bath renovation for this Roussane Model in Yardley Village. 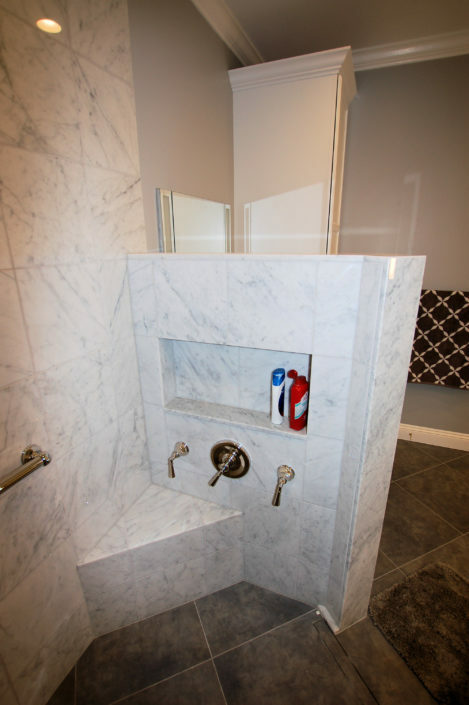 Owners had a Garden Tub that they never used and a small shower that was uncomfortable. They wanted a large walk-in shower that was “barrier free” (No Threshold & No Glass). They had done their homework and had great design ideas. 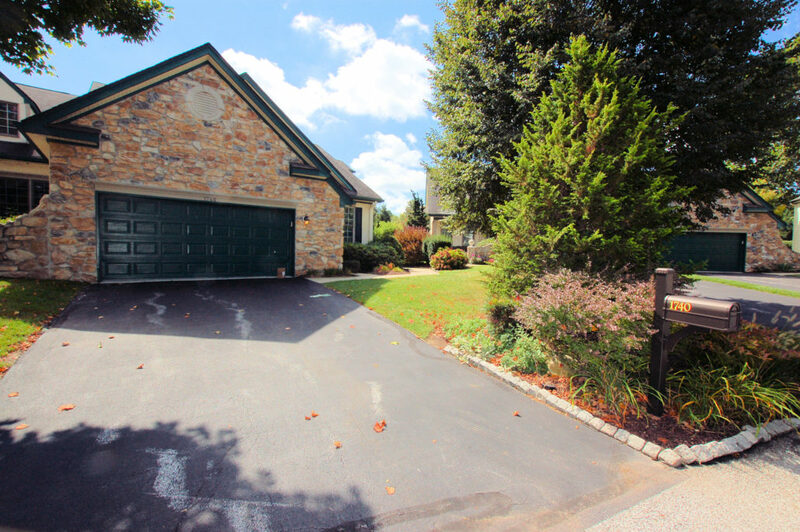 They had talked with previous Helping Hands Customers and knew exactly who they wanted working on the Project. Installation of New Custom Fieldstone Stratford Maple Cabinetry in White Tinted Varnish. Cabinetry included a generous double bowl Vanity plus a separate Dressing Area with Pantry Storage. Vanity Counter is Super White Quartzite with a two spacious rectangular under mount porcelain bowls. 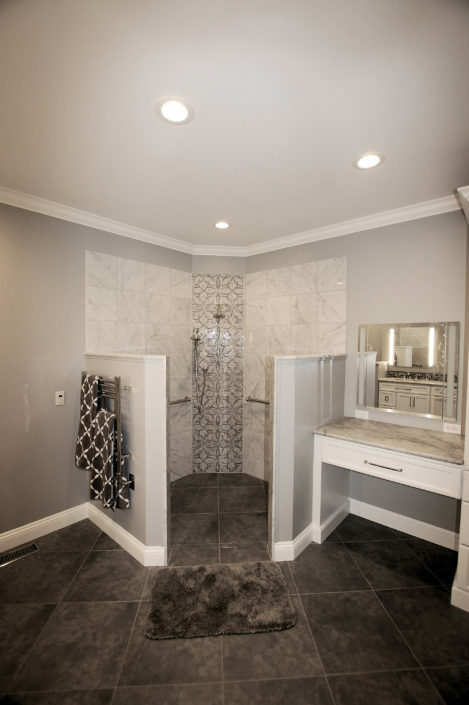 Vanity Wall was packed out to provide recesses for Custom Robern Medicine Cabinets and Matching Robern Mirrored Lighting. The Robern Lighting combined with the overall room general lighting provided by five LED recessed lights with dimmer control resulted in an excellent lighting design. A vent fan with primary light and separate night light was also provided to ensure proper ventilation. 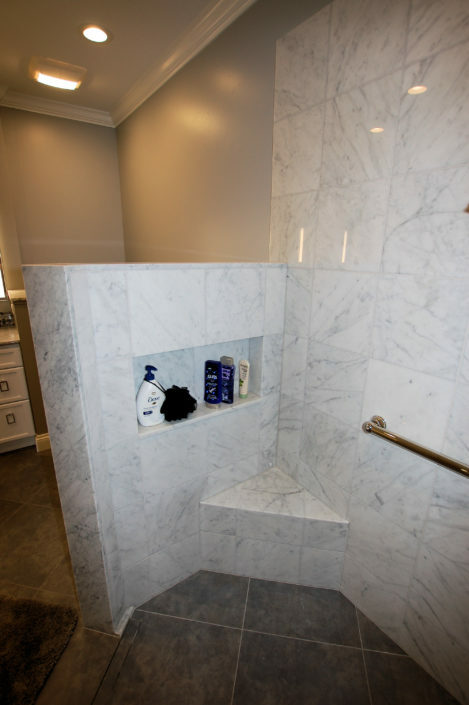 Two large shampoo niches are incorporated seamlessly into the tile design and twp corner seats are provided for convenience. Added Custom Crown Molding and tall baseboards in matching White Tinted Varnish to coordinate with the Cabinetry. Electric radiant floor heat was provided with digital programmable controller to ensure comfort. Electric towel warmer was also provided with digital programmable controller for convenience and comfort. 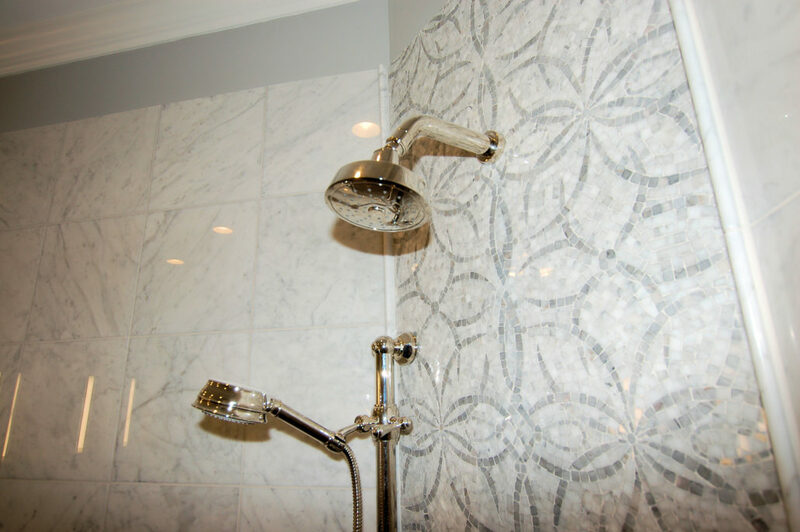 Beautiful coordinating tile mosaics were installed to provide accents for the Shower back wall and the Vanity Back Splash. Painting of all walls, ceilings, moldings, casings, and baseboards was provided. Creative Hexagon Shaped Walk-In "Barrier Free" Shower with No Glass to Clean!! 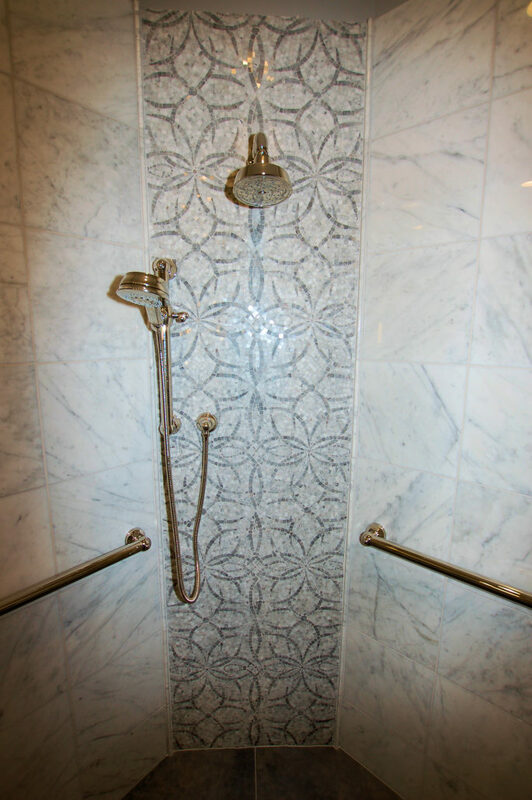 Shower Controls accessible from Outside the Shower so that you can adjust the temperature before you step in. 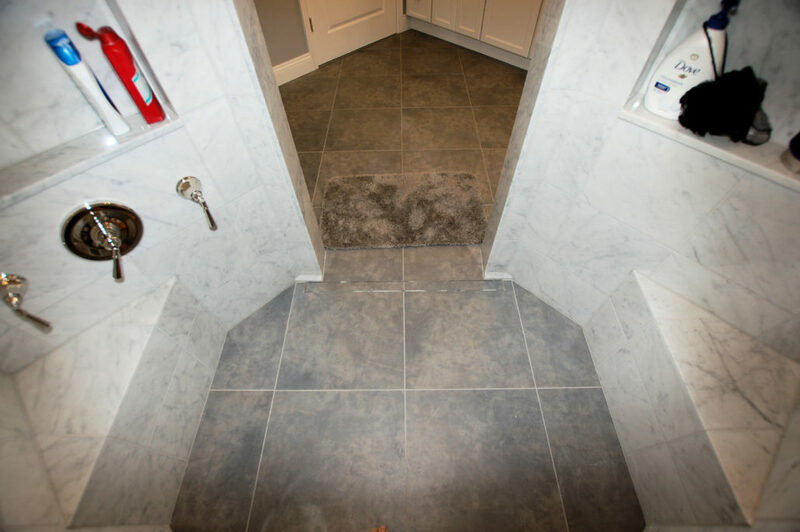 Large Format Floor Tile Runs Seamlessly into the Barrier Free Shower. 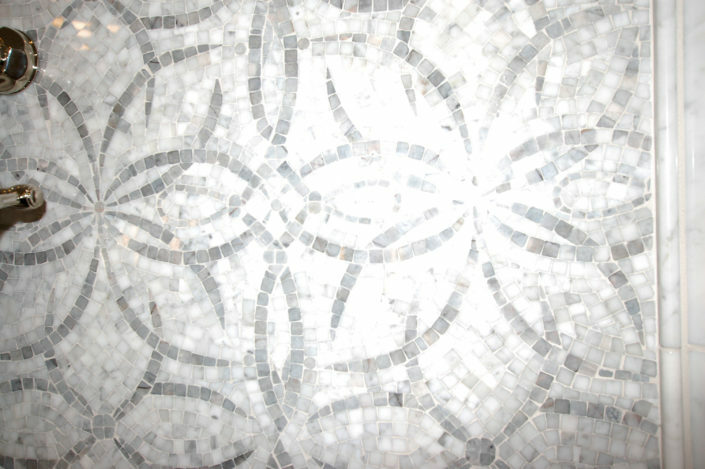 Tile has Special Honed Finish for Traction.